St. Margaret of Scotland started out as an Anglo-Saxon princess, exiled from England in the aftermath of the Norman invasion. Shipwrecked in Scotland, she and her family were rescued by the king, Malcolm Canmore. A gruff and hard-fought warrior who had previously overthrown the infamous Macbeth to claim the throne, he was a rough-and-tumble force to be reckoned with. One story tells how, when a peasant shot a wild boar in the king’s forest, he thereafter forced the lad to shoot an apple off his mother’s head! However, he did sincerely come to love Margaret, and when the two were wed, she not only helped reform her husband and tame his rowdy ways, but also cultivated his court into a place of learning and culture. Furthermore, she not only taught him the importance of prayer (he actually had her prayer books jewel encrusted as a sign of reverence for her devotions) but also the importance of generosity (donating to the Church and various charities, as well as founding Dumferline Abbey) and mercy (bringing relief, and sometimes release, to the English prisoners-of-war held in Malcolm’s dungeons). All in all, her example had a profoundly positive effect upon the king, and when he was killed in battle, Margaret succumbed to illness and grief. However their legacy lived on in their son David, who became an exemplary Christian ruler upon his ascent to the throne of Scotland. As a teen, Elizabeth of York was raised amidst court power-plays and brutal intrigues during England’s War of the Roses. After her father died, and her brothers mysteriously vanished in the Tower of London, she found herself being courted by her own uncle, King Richard III…who most people assumed was guilty of her brothers’ murder! Worse still, he was also suspected of having had his first wife poisoned in order to pursue Elizabeth. Understandably feeling less than safe in this position, she took the daring option of contacting Margaret Buford, the matriarch of her own family’s bitter enemy, the House of Lancaster, and negotiating a compromise. If her son, Henry, could overthrow Richard and rescue her from a sorry fate, she could marry him and thereby bring peace to the land by uniting the warring houses. In an age when high-born women were frequently used as pawns in political games, this boldness on her part was striking and notably shrewd. Henry did indeed overthrow Richard, and went on to marry Elizabeth. It was another rare story of genuine royal affection and shared interests. 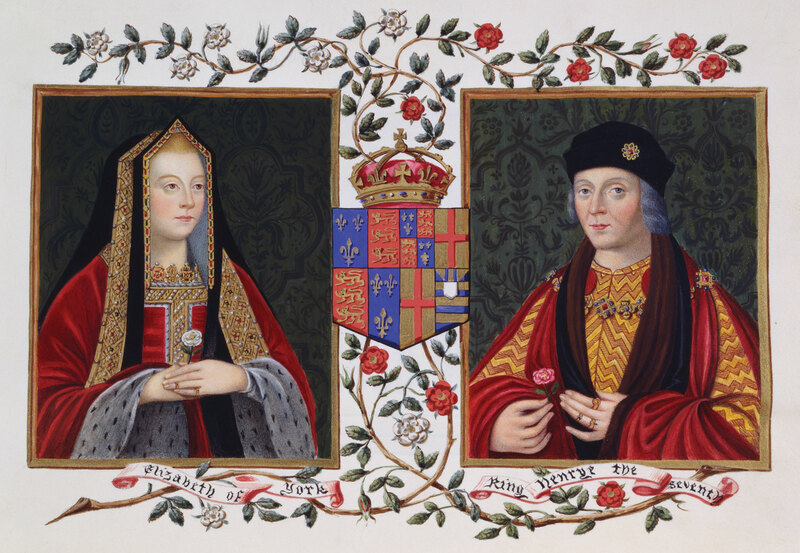 Not only did the two manage to bring together their respective houses, founding the Tudor dynasty, and thus bring peace to the realm, but they also shared an intimate relationship and monarchial partnership. Elizabeth herself became renowned throughout the land as the “Queen of Hearts” (she is the one depicted on the traditional deck of cards) for her gracious demeanor and generous donations to the Church and the needy. Henrietta Maria, the Catholic French princess, was betrothed to the Anglican King Charles I of England. At first, the union seemed to be set on rocky ground to say the least, with Charles giving Henrietta trouble over the presence of the priests accompanying her royal party. However, he eventually softened towards his young bride, allowing her a Catholic chapel where she might continue to hear mass and worship according to the precepts of her faith. The two of them formed a passionate bond, and Henrietta often gave the king advice on many issues. She tried to her best to help the persecuted Catholics of England, working to soften Charles’ judgments towards them, which was an easier task given that her husband was already a sympathizer with high-church practices, such as vestments, incense, and stained glass. One of the main results of her legacy was in weighing in on Charles’ decision to give the Catholic Lord Baltimore a land grant in the New World, enabling him to found a colony based on the premise of religious liberty where Catholic recusants and other persecuted Christian denominations might live in peace and security. The colony was called Maryland, ostensibly after Henrietta Maria herself, although it was also an undeniable sign of devotion to the Blessed Mother as well, a gesture which there is no doubt the earthly queen would have approved of whole-heartedly. When Princess Mary Stewart, the eldest daughter of King James II of England, was first married to William of Orange, Standtholder of The Netherlands, she could not stop crying through the entire ceremony. Not only was he significantly older than his teenage bride, but he also had a dour personality and was infamous for his Dutch thrift. William, meanwhile, was none-too-keen on marrying Mary, who he felt was intellectually inferior. However, Mary came to genuinely care about William’s well-being due to his poor health, and showed a motherly tenderness towards him. When dynastic struggles placed him in positions of danger on the battlefield, Mary wrote him loving letters of concern, and when William urged her to remarry should he die, she stated that she would never desire to be any other man’s wife but his. When they became joint monarchs of England, she served as both his consort and confidante, softening his bluff exterior and salvaging his less-than-sterling public relations. When Princess Charlotte was brought to England from her home in one of the German principalities to marry King George III, she was petrified. Aged 16, she would not only be meeting her future husband on the same day she would marry him, but she would also be assuming the role as Queen of England. To make matters more uncomfortable, the princess could barely speak a word of English, and she was tasked to sing the national anthem “God Save the King.” But when she was first presented to George in the garden, and proceeded to curtsy deeply in recognition of his rank, he enthusiastically pulled her up to his level and embraced her. He then did his best to make her feel at home by chatting at length to her in her native German about their common interests, including gardening and music. She discovered that he seemed like a decent sort who actually did want to have a happy life, and they both determined they would do all in their power to make their marriage work. And so they did, sharing an exceptionally close marriage and becoming the parents of 15 children. It is also interesting to note that George, when searching for a bride, had come across something from Charlotte’s past that had impressed him. When Frederick the Great had ravaged Charlotte’s homeland during wartime, she had personally written a letter to the conqueror pleading for mercy to be shown to her countrymen. Her courage and grace won the king’s admiration, and from it blossomed love. As these stories demonstrate, the bond of matrimony is often beset by trials and tribulations from outside sources, as well as the very human complexities we all have within us as individuals. Mutual compatibility is often fleeting, and we need both human resolution and divine intervention to get us through the personal everyday misunderstandings and struggles to reach a point of oneness and unity in marriage. Love is not merely broken down into a pristine wedding catalog image, but rather borne through a time-tested devotion that runs deeper than first emotions. As a Catholic, I consider it to be the manifestation of inward sacramental grace which serves as the strength to steer our ships through both calm waters and stormy seas. For Royals and Commoners alike, and no matter what our vocation, calling, or career may be, we must all strive to reflect Christ’s love in patience and humility, letting our light shine unto others.